The very mention of Harrogate produces, for many, an image of aristocratic gentility, fine hotels, parks and gardens, The Stray and, of course, a famous Spa. The town’s motto, ‘To Be of Service’, is oerhaos a clue to understanding the Harrogate story of the last century with its huge experience of ‘pleasing the visitor’. 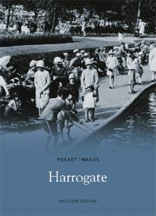 This book will appeal to all, residents or visitors, who know and love and Harrogate and would enjoy a nostalgic tour of the old town.